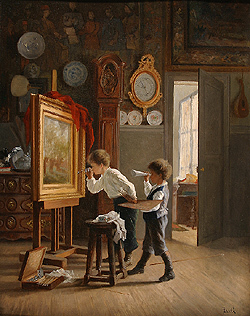 Interior genre and scenes of domestic activity were subjects that were explored by a number of 19th century artists throughout Europe and in the United States. The new middle class had a voracious appetite for these humorous and often sentimental scenes featuring children at play. Jean Paul Haag would have received his training in Paris during the 1860s and made his debut at the Paris Salon in the exhibition of 1870. Haag favored scenes of everyday life and often center on one or two figures in an interior, and display a quality and attention to detail that is only found in the works of the more successful artists of the period. Like many of his contemporaries, he traveled throughout the countryside in search of inspiration and we know that he spend time in the Normandy area. At the Salon exhibition of 1879 he exhibited Les Boules de neige and Le petit fileur. Today his painting Gardeuse d’enfants en Normandie is in the Louviers Museum.